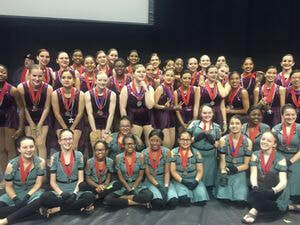 On Saturday, March 2nd the Alpharetta High School varsity winter guard competed in Winter Guard International’s (www.wgi.org) Atlanta regional held at McEachern High School. Our team competed against teams from Georgia, Tennessee, South Carolina, North Carolina, Alabama, and Mississippi. Our winter guard placed second in their preliminary round of competition and ended up finishing in third place overall in the final round of competition. This amazing finish has our team currently ranked 11th in the nation (as of March 4, 2019). They have one more regional competition at Winthrop University in South Carolina on March 23 and then they will travel to Dayton, Ohio, during spring break to compete against 147 teams in Winter Guard International’s World Championships. The Alpharetta Varsity Winter Guard began its Winter Guard International (www.wgi.org) competition tour this past weekend in Knoxville, Tennessee. They competed with teams from all over the southeast. The team finished first in their round winning all captions. This qualified them to compete in the final round. In finals, the team had quite an emotional performance and received a standing ovation from the audience. The judges were very impressed and awarded the team a first place finish for the entire competition. This placement has our team now ranked #5 in the country!! The team will continue its national competition tour in Atlanta on March 2 and then at Winthrop University in South Carolina on March 16. They will finish the season competing at the Winter Guard International World Championships in Dayton, Ohio, during spring break. Mr. Jenkins, Mrs. Schlosser, Mrs. Lukes, Mr. Parent and Mr. Walsh are very proud of the team and their hard work. ​CONGRATULATIONS TO OUR VARSITY WINTER GUARD SENIORS!!! This video does a great job explaining what winter guard is. Color guard is the outdoor version of winter guard with the marching band added.